Last Thursday, I attended a gathering of the SMA Fathers who have been working in Boston for the summer. 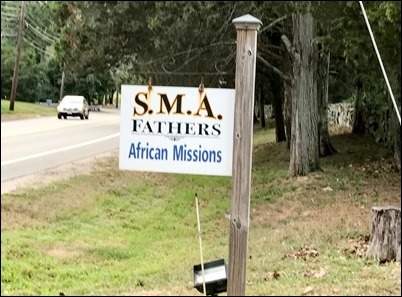 Each summer, a group of about a dozen young African SMA priests come to help out in parishes throughout the archdiocese, and towards the end of the summer, we hold a gathering with a Mass and dinner of appreciation for them. 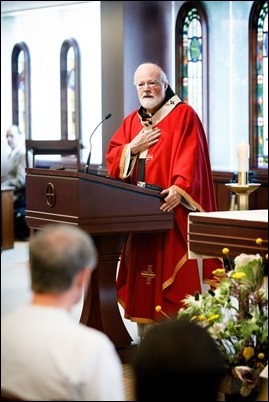 Many of the pastors and members of the parishes where the priests served were there with us. 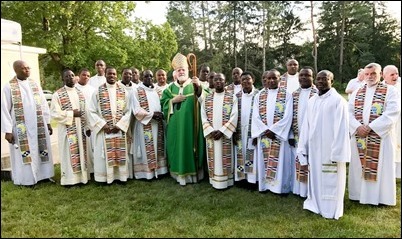 The Society of African Missions was originally an Irish community that started working in Africa, and now their priests come from many of the different African countries where they serve. 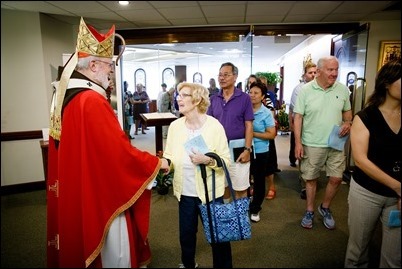 It has been a great blessing for us to have priests from these countries present in our archdiocese. 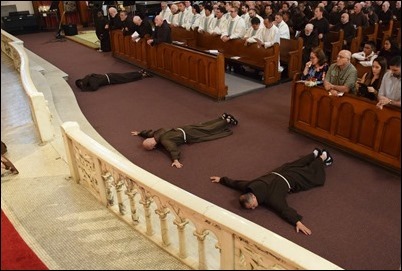 First of all, it allows Boston Catholics to be exposed to these young priests from Africa and to learn more about the Church in Africa, which in the Church today, is the continent that is growing fastest and is most vibrant. 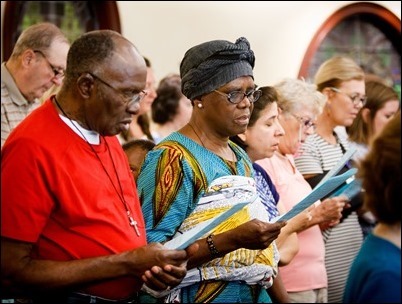 Also, because we have a growing African community within the archdiocese — with many Catholics coming to us from Ethiopia, Cape Verde, Kenya, Uganda, the Congo, Nigeria, Cameroon and many other nations — it’s nice to have a connection with the country of origin of so many of our new Boston Catholics. 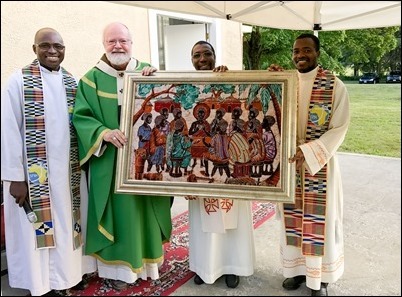 During the dinner, the SMA Fathers presented me this beautiful image of the Last Supper from Africa. 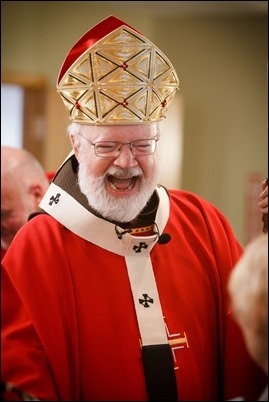 We plan to hang it in the formal dining room of the Pastoral Center. 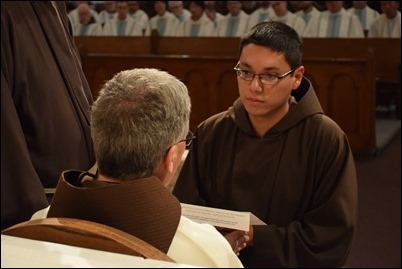 This past weekend, I went to Pittsburgh to be present as three of our Capuchin seminarians made their solemn vows of profession – Brothers Keon Tu, Diogo Escudero and Saúl Soriano. 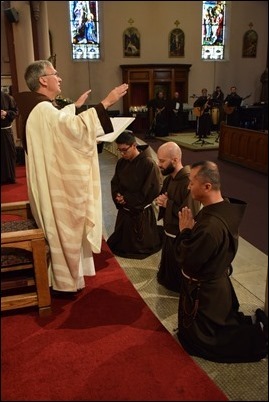 They were professed in St. Augustine Church, the very church where I made my profession so many years ago. 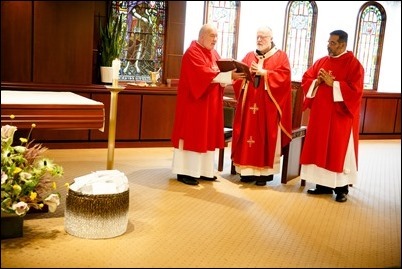 It was also the church where I was ordained a priest. At the time it was a fully German parish, and even the church building itself is a replica of the Church of St. Beno in Bavaria. 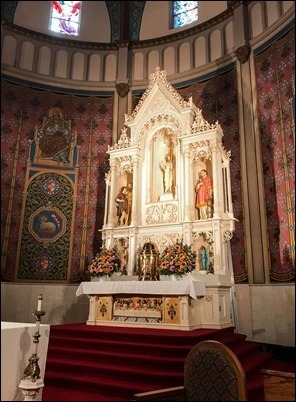 The high altar in St. Augustine’s was made by the Capuchin brothers from Germany. 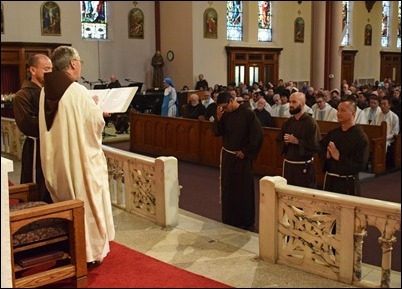 Our German-American province is now very much engaged with the new immigrants, and vocations are beginning to emerge from those communities, and we’re very grateful for that. 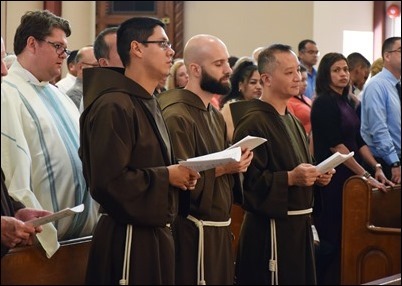 This year, the three men making solemn professions each come from a different immigrant community — Brother Keon is Chinese, Brother Diogo is Brazilian and Brother Saúl is from El Salvador. 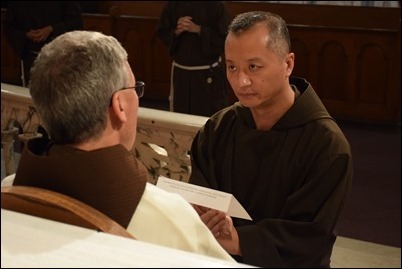 At the end of Mass, Father Provincial Tom Betz asked me to address the Portuguese and Spanish-speaking communities, which I was happy to do; and Father Tom, who speaks Chinese, offered some words of greeting to the members of the Chinese community who were present. 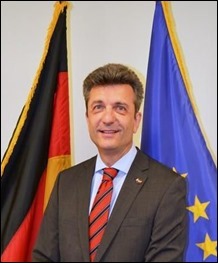 On Tuesday, I met at the Cathedral with the Consul General of Germany in Boston, Ralf Horlemann. 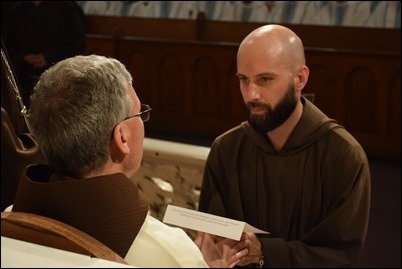 He came to see me at the Cathedral to update me on activities at the German International School in Boston, which is housed at one of our parishes, St. Anthony’s in Allston. He was very pleased to report that the school is thriving and that they have a waiting list for admission. Wednesday, I had another diplomatic visit, so to speak. 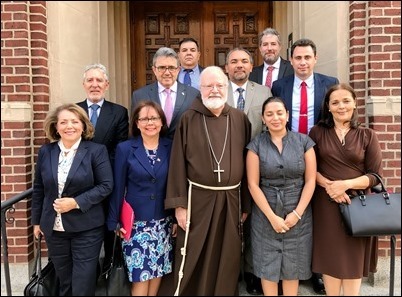 This time, I met with a group of consuls from nine different Latin American countries at the Cathedral. The gathering is organized by the Consul General of Mexico, Emilio Rabasa Gamboa. 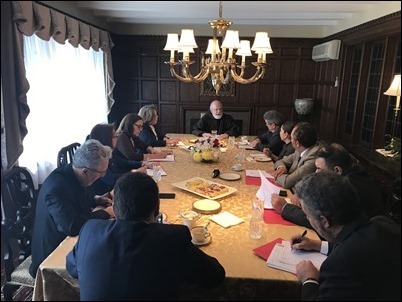 This group of consuls from Latin American countries in Boston meet once a month, and they wanted to meet with me to talk about some of the needs of the Latin American communities in Boston. They also shared with me some of their thoughts on immigration and the kinds of services that their immigrant populations required, many of which are being met by the consulates themselves. 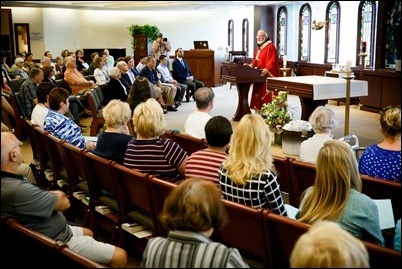 They also asked if we could arrange to have an annual Mass inviting the different consulates together and I was very pleased to entertain that request. 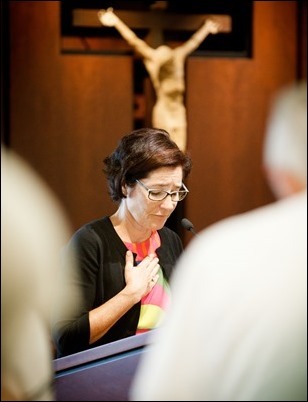 Yesterday, we celebrated a special Mass in the Pastoral Center’s Bethany Chapel for the special intentions of our Catholic Appeal donors. 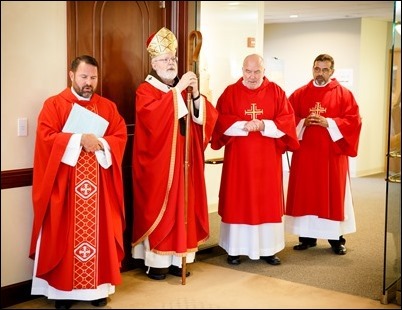 It was the feast of St. Bartholomew and also happened to be the first anniversary of the episcopal ordination of Bishops Reed and O’Connell, who were ordained on that date last year. 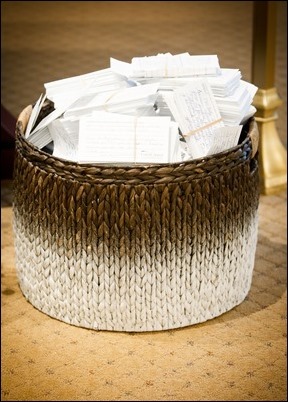 Each year, when people make their donations to the Catholic Appeal, they are invited to include their prayer intentions, and during the Mass, we placed a basket with all the prayer intention cards before the altar. 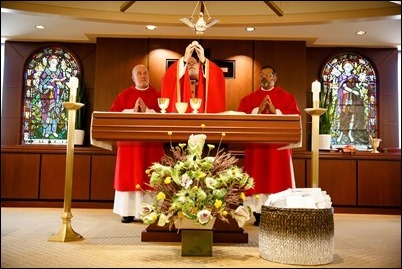 So we prayed for those intentions and for all our benefactors during the Mass. 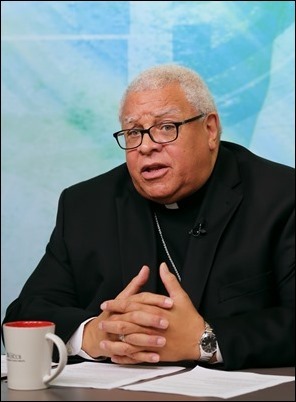 Finally this week, I want to add my voice to those welcoming the establishment of the U.S. Conference of Catholic Bishops’ new Ad Hoc Committee Against Racism that will be chaired by Bishop George Murry of Youngstown, Ohio. 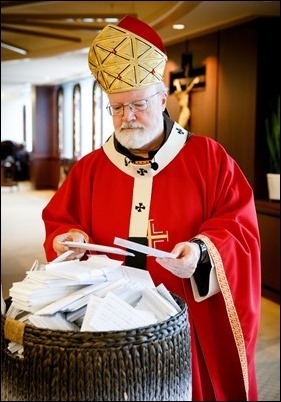 Bishop Murry was formerly the Bishop of St. Thomas in the Virgin Islands, and he is a Jesuit Father. 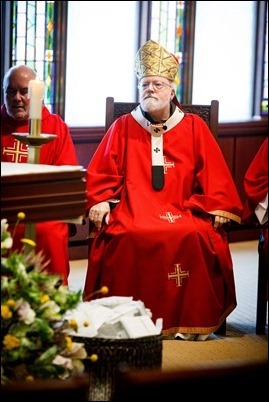 He is a very capable individual, and I was delighted that he has been given this responsibility by the bishops’ conference. The recent demonstrations and the xenophobia we see around immigration show that racism is still a serious moral challenge for our country. 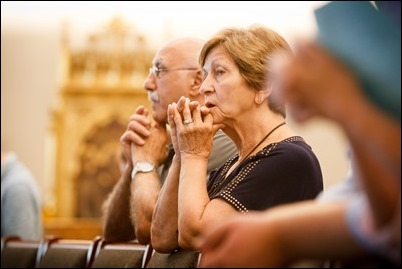 So, the Church needs to be engaged in trying to heal the wounds of racism that so deeply affect American society. I know this committee will be a very important part of that effort.